How much forest is enough for a gibbon? I hadn’t heard them in several months. I think they spend most of their time (wisely) in the parts of the patch farthest from the village, so we do not hear them often. However, I also worry when I have not heard them for a while that they are no long there. How small a patch is enough for the long-term persistence of a gibbon pair? The patch available is at most 60 ha (KML file). 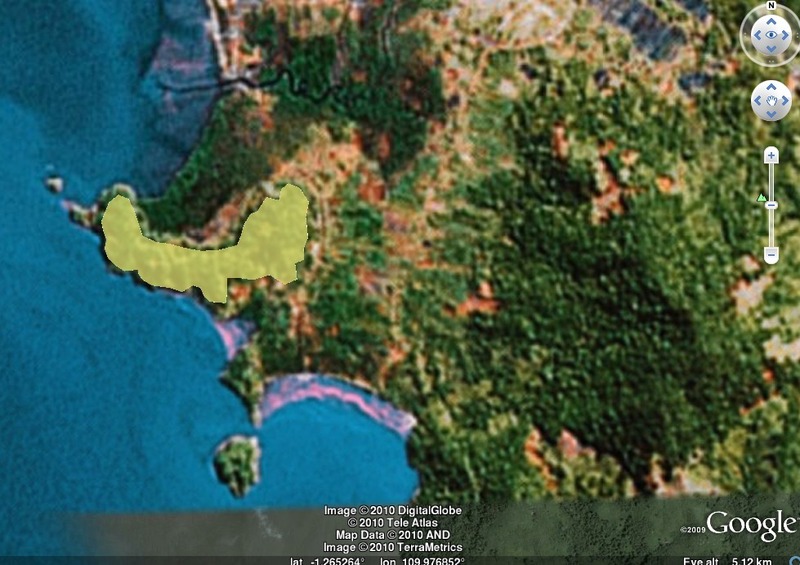 A study in the nearby Gunung Palung National Park by John Mitani (1990) found a density of ca. 15 individuals per sq. km, or ca. 6.5 ha per individual, so our patch may be big enough to hold a group of 2-4 permanently, but the forest quality here is far below that in the intact forest at GP. The level of degradation in our patch seems not to have changed too much since we’ve been here (4 years), so it’s possible the population is stable. However, there is also a much larger hill to the East (Gunung Peramas, see image) loaded with gibbons, whose songs can be heard across the valley nearly every morning. This may be a source for our patch, which may always be a sink over the long term, but I’ve never heard of a gibbon being seen trying to cross the matrix of invasive Acacia mangium and farmland that covers the valley. Whatever the long-term sustainability of this forest resource patch for gibbons, far more important for their immediate existence is the fact that the local villagers do not hunt primates for food. And so we can still enjoy the wonderful song of these lovely animals. Mitani, J. C. (1990). Demography of agile gibbons (Hylobates agilis). International Journal of Primatology 11 (5), 411-424.